Due to Windows 7 release, many people indirectly upgrade from IE6 -> IE8 these days. You can see this here and here. 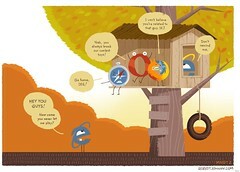 With IE7, IE8, FF, Chrome, Safari & Opera - the web would look much better. PPK's forecast - that adding IE6 support would cost more money to the business - is becoming real. This basically means that web is getting more standard than it used to, and "sites the work only in IE" should become rare even in the short term. Amen. This entry was posted in Web and tagged firefox, ie, Microsoft, Web on December 4, 2009 by Oren. What is it good for? Well, accessing the whole .NET framework with Python code is quite a strong feature. IronClad project aims to allow accessing CPython (the popular implementation) binary modules, not sure how mature it is. First impressions? 2.0RC2 seems pretty mature. Most of the "random" .NET classes I've been trying out seemed to work flawlessly. Load time is a bit slow. But all in all, it seems pretty good. note that mscorlib is needed for many common namespaces, such as Microsoft.Win32. In MSDN, the "assembly name" is specified for each namespace, so it's easy to find out. The CPython _winreg implementation works fine, however in IronPython there's currently a little problem: "high ascii" (>128) chars are getting screwed because of some converting/encoding problem (uses System.Text.Encoding.ASCII which is 7bit aware). My workaround was to use directly the Microsoft.Win32.Registry implementation, and manually convert the returned Microsoft Byte Array to native Python string of bytes. If you need the code, comment me and I'll add it. I was looking for some "py2exe" compiler, but found out that the compiler itself is available as an IronPython class, and anyone can call it from their own Python script to fit their needs. Still, I use the pyc code (command line compiler). Note: find the latest version of this script, cuz old versions (IronPython v1.x don't fit!). Current latest hides in "IronPython 2 Beta 4" release. "clr.AddReference()" lines are sometimes (always?) not needed when using the interpreter, but are always required in EXE. I find a "make" system pretty needed for IronPython. Windows.Forms is an integral part on .NET, and as such, is native to IronPython. IronPython Studio aims to allow nice GUI drawing tool (ok ok, an IDE). Still a bit buggy (I've lost 1hr annoying-design-work cuz it wasn't saved well), but it surely helps designing. Debugging tools: haven't checked that area yet. This entry was posted in Code and tagged Microsoft, python, Scripting on December 3, 2008 by Oren. Or: "how to set draft printing quality as default"
I've had two pretty modern (year 2006+) HP InkJet printers. Their driver adds a new tab to the Windows "Printing Preferences" dialog (I really enjoy those vendor-specific dialogs! ), through which one can change the printing quality. However, the GUI designer forgot (or the MS API doesn't allow) a "make this the default" button, which is a MUST in my opinion. A quick digging revealed the forbidden truth, though. So, how can we really set the default printing quality? Microsoft (and Apple), as the biggest OS vendors, have the [almost] ultimate power: they set the rules for most of the world computers, and they set the defaults. By making power-saving options very straightforward, and even making the defaults environment-friendly, they can decrease the world power saving by very large numbers. Same should go with Ink saving. This entry was posted in environment and tagged environment, hp, Microsoft, windows on September 6, 2008 by Oren.